In hippocampus, the antibody recognizes the stratum radiatum, the layer formed by the fibers of denate granule cells, as they synapse onto hippocampal pyramidal cells. In rat retina, it stains the membrane of the amacrine cell bodies and inner plexiform layer. It recognizes some neurons early in development and can be detected on migrating amacrine cells in embryonic retina. Recombinant fragment corresponding to Rat Syntaxin aa 3-225. Our Abpromise guarantee covers the use of ab3265 in the following tested applications. WB 1/100. Detects a band of approximately 31 kDa (predicted molecular weight: 35 kDa). Potentially involved in docking of synaptic vesicles at presynaptic active zones. May mediate Ca(2+)-regulation of exocytosis acrosomal reaction in sperm. ICC/IF image of ab3265 stained PC12 cells. 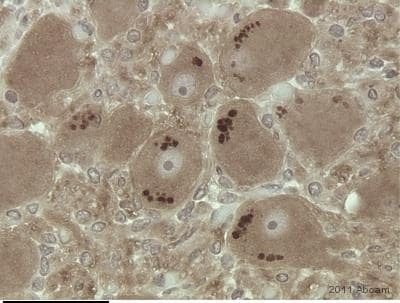 The cells were 4% formaldehyde fixed (10 min) and then incubated in 1%BSA / 10% normal goat serum / 0.3M glycine in 0.1% PBS-Tween for 1h to permeabilise the cells and block non-specific protein-protein interactions. The cells were then incubated with the antibody (ab3265, 1µg/ml) overnight at +4°C. The secondary antibody (green) was Alexa Fluor® 488 goat anti-mouse IgG (H+L) used at a 1/1000 dilution for 1h. Alexa Fluor® 594 WGA was used to label plasma membranes (red) at a 1/200 dilution for 1h. DAPI was used to stain the cell nuclei (blue) at a concentration of 1.43µM. Publishing research using ab3265? Please let us know so that we can cite the reference in this datasheet.